The 45th Guards Independent Spetsnaz Brigade (Russian: 45-я отдельная гвардейская бригада специального назначения (45-я ОБ СпН); Military Unit Number 28337) is a special reconnaissance and special operations military unit of the Russian Airborne Troops, based near Moscow. It was formed in 1994 as the 45th Independent Spetsnaz Regiment, and expanded to a brigade in 2015. It was created in 1994 from the 901st Air-Assault Battalion (created in 1979) and 218th Spetsnaz Battalion of the Russian Airborne Troops, (created in 1992). Colonel Pavel Popovskikh is credited with the creation of the 45th Spetsnaz as a “subunit of the future” designed for the type of counter-insurgency, warfare for which the forces had been so unprepared in Afghanistan. 218th Battalion is based in Moscow-Sokolniki. 901st Battalion was formed on November 20, 1979. As of 2016, the unit was upgraded to a brigade and it's spetsnaz companies were tripled from six to eighteen, increasing the capability of the unit from two operational areas to three. The unit is part of the Russian Airborne Troops (VDV RF) and directly subordinated to VDV Headquarters. However it is also operationally subordinate to the GRU. The brigade was formed on the basis of two battalions, each of which had a history of establishment and development. With an initial strength of 800 highly qualified personnel, the unit had especially powerful special reconnaissance capabilities and innovations to include unmanned surveillance aircraft and tailored psychological warfare assets. Almost all of its officers were “prepared in the GRU spetsnaz system”. The 901st battalion was formed on November 20, 1979, on the territory of the Transcaucasian Military District, and was immediately transferred to Czechoslovakia, Central Group of Forces. In March 1989, in connection with the withdrawal of Soviet troops from Eastern Europe, the battalion was relocated to Aluksne, Latvian SSR and transferred to the Baltic Military District. In May 1991, the battalion was transferred to the Transcaucasian Military District and relocated in Sukhumi, Abkhaz ASSR. In August 1992, the battalion was transferred from the authority of the Transcaucasian military district under the authority of the staff of the airborne troops and renamed 901st Separate Airborne Battalion. As a separate battalion, it was transferred to the 7th Guards Airborne Division. In 1993, during the Georgian-Abkhazian conflict, the battalion performed tasks for the protection and defense from looting and destruction of important military and Government facilities in the territory of Abkhazia. During this period, eight members of the battalion were killed, before the end of performing their military duty, and about 20 men were wounded. For combat missions thirteen men were awarded order "for personal courage", twenty one men-the Medal "for courage" and one man the Medal "for merit". In October 1993, the battalion was relocated from the city of Sukhumi to the Moscow region, where in February the following year it was transformed into the 901st Special Purpose Battalion. With the beginning of the formation of the Special Purpose Regiment, the battalion was included in its composition. The 218th Battalion of Special Forces Airborne Troops was formed July 25, 1992. By order of the Commander of the Airborne Troops in the historical continuity this day is considered to be the day of formation of this battalion. The battalion was involved as a peacekeeping force in the zones of inter-ethnic conflict in the Transdniester region in June and July 1992, in North Ossetia in September–November, 1992 and in Abkhazia in December 1992. Many battalion members were awarded State Awards for bravery and heroism. Active use of this battalion in solving special tasks in various conflicts showed the need to build other special forces with similar tasks in the airborne troops and their integration in the regiment. By July 1994, the regiment was fully formed, staffed with personnel, equipment and proceeded to battle school. December 2, 1994, the regiment traveled to the Northern Caucasus to take part in the operations against rebel forces on the territory of the Chechen Republic. During the period from December 12, 1994, to January 25, 1995, reconnaissance groups and groups of special units of the regiment, in conjunction with the parts of the Airborne Troops, took part in the fighting on the most important targets of the enemy, including partaking in the Battle of Grozny (1994–95). On February 12, 1995, parts and units of the regiment returned to their permanent home base in Sukhumi. 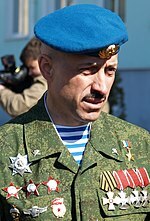 Anatoly Lebed was a famous paratrooper and commanding officer of the regiment. By March 15, 1995, the consolidated unit the regiment newly arrived in Chechnya, continuing to carry out combat missions until June 13, 1995. By Decree of the President of the Russian Federation dated July 21, 1995, Commander of the intelligence group special purpose Senior Lieutenant Ermakova, for the courage and heroism shown during the special task command to disarm Chechen rebels, was awarded the title Hero of the Russian Federation (posthumous). On July 30, 1995, the unit solemnly opened the monument in memory of the Scouts. On May 9, 1995, the regiment was awarded the diploma of the President of the Russian Federation for services to the Russian Federation. The regiment participated in the parade dedicated to the 50th Anniversary of the Victory over Nazi Germany. From February to May 1997, the consolidated unit the regiment took part in the peacekeeping mission in the zone of separation of Georgian and Abkhaz armed forces in the town of Gudauta. On July 26, 1997, the regiment was given the battle flag and charter of the 5th Guards Mukachevo Order of Kutuzov 2nd class Airborne Rifle Regiment of the 2nd Guards Airborne Division, which had been disbanded on June 27, 1945, in order to provide historical continuity from the airborne units of World War II. From September 12, the Regiment took part in special reconnaissance and anti-terrorist operations in the North Caucasus. "We have identified those persons who are now in Sloviansk and Kramatorsk. They represent a unit of the 45th Regiment "Kupyanka −1", which is housed near Moscow. This unit is now operating in the territory of Ukraine." Russia denied the presence of its troops in the east of Ukraine, as it had previously denied their involvement in the occupation of Crimea. In May 2012, 22 soldiers from the 45th Detached Reconnaissance Brigade visited Fort Carson, Colorado. While there the 22 soldiers received some training from U.S. Special Forces more specifically 10th Special Forces Group. The soldiers from the 45th Detached Reconnaissance Brigade received courses on operating certain American weapons and becoming familiar with certain American Special Force's tactics. There was an emphasis placed on reconnaissance, mountain insertion, destroying terrorist camps, and demolitions. A friendly informal shooting competition took place in which the Russian soldiers won. The Russian soldiers of the 45th Detached Reconnaissance Brigade also impressed the U.S. Special Forces soldiers with their high level of physical fitness. The regiment has staged youth competitions for military-applied kinds of sports among military patriotic clubs. At different celebrations in Moscow and the Moscow region, it held demonstrations and skydiving performances by paratroopers, with commandos demonstrating hand-to-hand fighting. Every year since 1995, special operations group, formed on the basis of the regiment, takes part in the international competition among special forces from the United States, Germany, Belgium, Spain, Greece, Serbia, Romania, Bulgaria and Russia, held in Bulgaria on the Partnership for Peace Program. In 1996, the regiment took the prize-winning group a third place in the overall standings, and the next year became the champion of 1997. ^ a b "Airborne Troops (VDV)". Russian Military Analysis. 2015. Retrieved 18 November 2015. ^ "45-й гвардейский отдельный разведывательный полк ВДВ" [45th Guards Detached Reconnaissance Regiment of the VDV]. bratishka.ru (in Russian). Retrieved 18 November 2015. ^ Sutyagin, Igor; Bronk, Justin (2017-12-22). Russia's New Ground Forces: Capabilities, Limitations and Implications for International Security. ISBN 9781351018524. ^ "Структура ВДВ" [The structure of the VDV]. bratishka.ru (in Russian). 2015. Retrieved 18 November 2015. ^ "Numeration and history of units". History of Soviet Spetsnaz (in Russian). Archived from the original on February 16, 2012. ^ a b "45 отдельный полк специального назначения ВДВ (45 гв. ОП СпН ВДВ)" [45 Detached Regiment of Special Purpose VDV (45 GW. OP Spetsnaz VDV)]. spec-naz.org (in Russian). Retrieved 18 November 2015. ^ "45-я отдельная гвардейская орденов Кутузова и Александра Невского бригада специального назначения ВДВ". structure.mil.ru. Retrieved 2019-03-20. Wikimedia Commons has media related to 45th Separate Reconnaissance Regiment. This page was last edited on 12 April 2019, at 03:59 (UTC).